Is it legal for a sitting President to be “wire tapping” a race for president prior to an election? Turned down by court earlier. A NEW LOW! 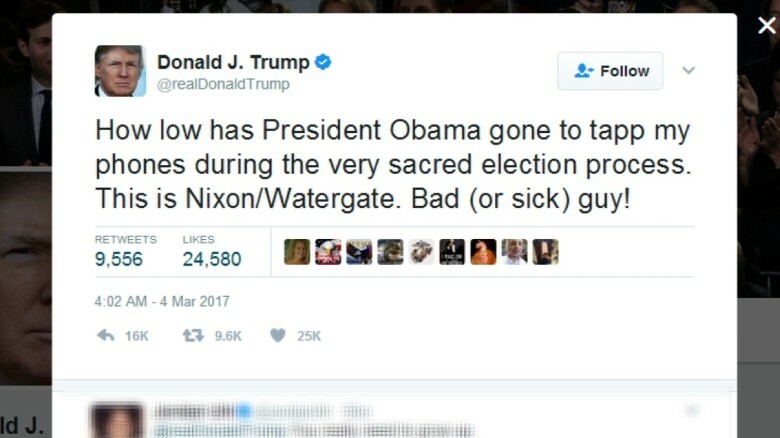 I’d bet a good lawyer could make a great case out of the fact that President Obama was tapping my phones in October, just prior to Election! This round was preceded by a Tweet accusing the Obama administration of setting up Jeff Sessions, and followed by a Tweet attacking Arnold Schwarzenegger (who recently announced he is leaving Celebrity Apprentice). Trump’s speech on Tuesday, received strong approval in the polls and the stock market soared. There were subsequently questions as to whether Trump was at least managing to act sane in public, and the Trump administration even postponed the release of the updated travel ban to take advantage of the positive reception. By late in the week, the news was dominated by stories of Attorney General Jeff Sessions having lied to the Senate about having met with the Russian ambassador. This does look like a warped response by Trump to the negative stories, and resolves any questions as to whether Trump is capable of changing his behavior. Mr. Trump’s aides declined to clarify whether the president’s explosive allegations were based on briefings from intelligence or law enforcement officials, or on something else, like a news report. A spokesman for Mr. Obama did not immediately respond to a request for comment. The president’s decision to lend the power of his office to such an accusation — without offering any proof — is remarkable, even for a leader who has repeatedly shown himself willing to make assertions that are false or based on rumors. It would have been difficult for federal agents, working within the law, to obtain a wiretap order to target Mr. Trump’s phone conversations. That would mean the Justice Department had gathered sufficient evidence to persuade a federal judge that there was probable cause to believe that he had committed a serious crime or was an agent of a foreign power, depending on whether it was a criminal or foreign intelligence wiretap. Trump’s top aides were caught off guard by the tweets Saturday morning, a senior administration official said. The president is scheduled to spend a quiet day golfing and relaxing at his Mar-a-Lago resort in Palm Beach, Fla. After several days without a controversial tweet and a relative message discipline following his speech to Congress Tuesday evening, Trump’s angry Twitter tirade marked a return to form—and a trusted tactic of turning around the exact words being used against him on his opponents. Posted in Barack Obama, Blogs & Social Media, Donald Trump, Richard Nixon. Tags: Alternative Facts, Arnold Schwarzenegger, Barack Obama, Donald Trump, Jeff Sessions, Richard Nixon, Russia, Watergate. RSS feed for comments on this post.. TrackBack URL.